The UN’s latest Millennium Development Goals Report notes that progress in sanitation has largely bypassed the poor while rural populations remain disadvantaged. An analysis of trends over the period 1995-2008 for three countries in Southern Asia shows that improvements in sanitation disproportionately benefited the better off, while sanitation coverage for the poorest 40 per cent of households hardly increased. Although gaps in sanitation coverage between urban and rural areas are narrowing, rural populations remain at a distinct disadvantage in a number of regions. 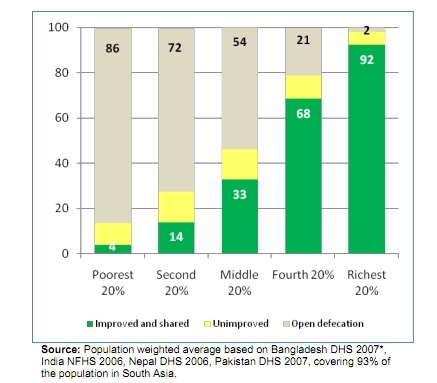 A similar graph (below) taken from a joint UNICEF/WSSCC/WaterAid paper prepared for SACOSAN IV shows the combined sanitation disparities for the four South Asian countries of Bangladesh, India, Nepal and Pakistan. And here a figure on sanitation disparities in Sub-Saharan Africa from the 2010 JMP update. Unlike for water supply, the world is far from meeting the MDG sanitation target, the report says. At the current rate of progress, it will take until 2049 to provide 77 per cent of the global population with improved sanitation. Almost half the population of developing regions and some 2.6 billion people globally were not using improved sanitation in 2008. That year, an estimated 1.1 billion people practised open defecation. Globally, however, open defecation rates have declined by one third, from 25 per cent of the population in 1990 to 17 per cent in 2008. Almost two thirds of the people who practise open defecation live in Southern Asia. Northern Africa is the only region that has already surpassed the MDG sanitation target. Coverage increased from 72 per cent in 1990 to 89 per cent in 2008. 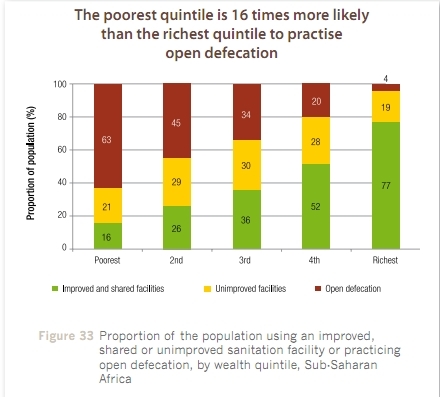 Rural populations everywhere are disadvantaged when it comes to improved sanitation, though disparities with urban areas are decreasing in all regions. Globally, an urban resident is 1.7 times more likely to use an improved sanitation facility than someone living in a rural area. Inequalities are most stark in Southern Asia, where an urban resident is 2.2 times more likely to use an improved facility than a rural resident. Still, this represents significant improvement since 1990, when an urban resident was 4.3 times more likely to use an improved sanitation facility than a person living in a rural area. This entry was posted in Progress on Sanitation and tagged MDGs, rural sanitation, sanitation coverage, United Nations. Bookmark the permalink. Ok, but which three countries in Southern Asia is this? Kind of important if we are to guess whether CLTS is having the impact that many hope. Why the secrecy? David, I have added a similar graph from a paper prepared for SACOSAN IV which shows the combined sanitation disparities for Bangladesh, India, Nepal and Pakistan.